In all 6 years that I have been water-cooling, this is the first time I've had legitimate build up. Backing up, I had left my PC unused but on for 1-2 months, I was too busy with other things in life to use it, left it on so it kept everything auto updated. 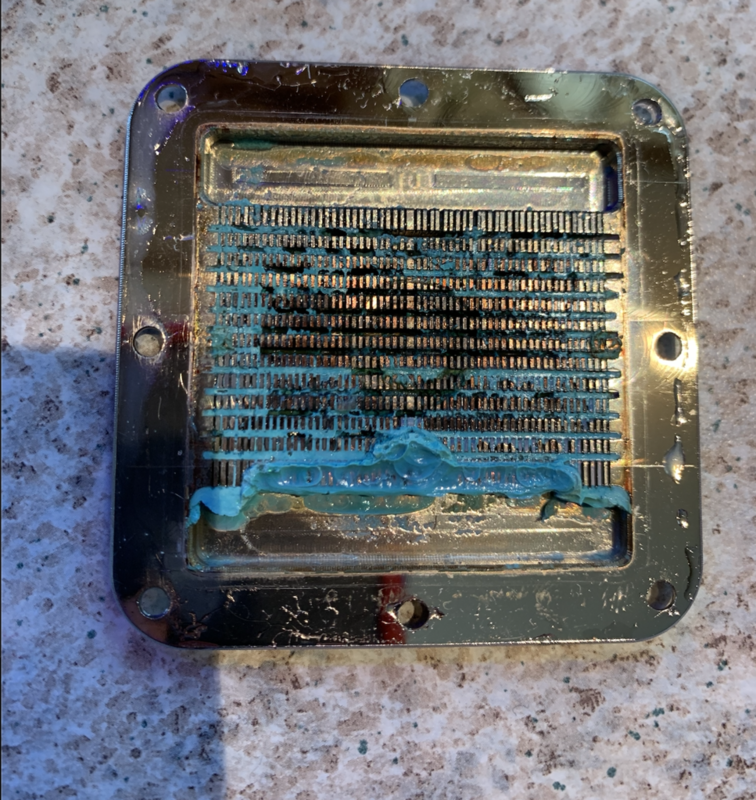 Came back today to use it and completely frozen, restarted, UEFI error for cpu over temp, idling at over 90c, my liquid was super hot to the touch, noticed build up in the water block after taking off the side panel. Pump is ruined from spinning for so long without any flow. CPU block was completely plugged so no flow was happening. Drained and cleaned everything in the loop and a new pump is on the way, but I am trying to salvage the block if possible. Any ideas? Again I've never had this kind of buildup before so this is new for me. I've heard toilet bowl cleaner will dissolve it and to scrub with a toothbrush, but don't want to try it unless it's going to be safe on the metal. What fluid and components are you using? As for cleaning regular soap and water with a toothbush or something to get into the fins will do. Primochill ice coolant and soft tubing, EK CoolStream SE 240 Radiator, Swiftech Apogee XL2 cpu block, and XSPC D5 Photon Res and pump. What coolant was this? Was it something you haven't used before? What is your method for cleaning your radiators? What kind of tubing do you use? Primochill ice coolant ﻿and soft tubing, EK CoolStream SE 240 Radiator, Swiftech Apogee XL2 cpu block, and XSPC D5 Photon Res and pump. If that was suppose to be transparent coolant it looks it settled out or was due to plastizer in the loop, what tubing was used? Primochill Ice. First time using it yeah, I've used XSPC EC6, Mayhems X1, and EK Cryofuel before with no issue. The only things that have changed this round is my radiator to an EK CoolStream SE 240 and the coolant to Primochill. I clean my loops with the Primochill sys prep and distilled warm water. That primochill tubing is good and known to not leech readily like that, only thing I can think of is the fluid reacted with something. There's nothing apparent that you did wrong as far as I can tell. I know that some coolant mixtures can break down if the water/coolant ratio is wrong or if there is acidity in the loop (usually from cleaning with vinegar etc). It didn't happen nearly as quickly as yours did, but I had EK Cryofuel break down on me 2 different times slowly over the course of 2-3 months, and I couldn't for the life of me figure out why. Switched to Mayhems X1 and have been problem free for over a year. Could be my ratio, I'm gonna make a fresh batch. Warm soapy water to clean the block, use a soft brush, like a toothbrush. You can use some toothpaste to help remove any stubborn spots. For your rads, use some vinegar, its usually a 5% acid, so just use straight vinegar, leave it soak for 10-20minutes then flush thoroughly with baking soda solution to neutralize, and flush again with regular water then a final flush with distilled, or just use distilled if u have a lot readily available. Don't forget to also clean your fittings. Once you think everything is sorted, put the loop together outside the case and run it with straight distilled for a couple hours and drain/flush again. After that u should be good to assemble and refill for the final time. This what i done recently with my loop after 4 years without a flush, though i never used colored coolants or premixes.